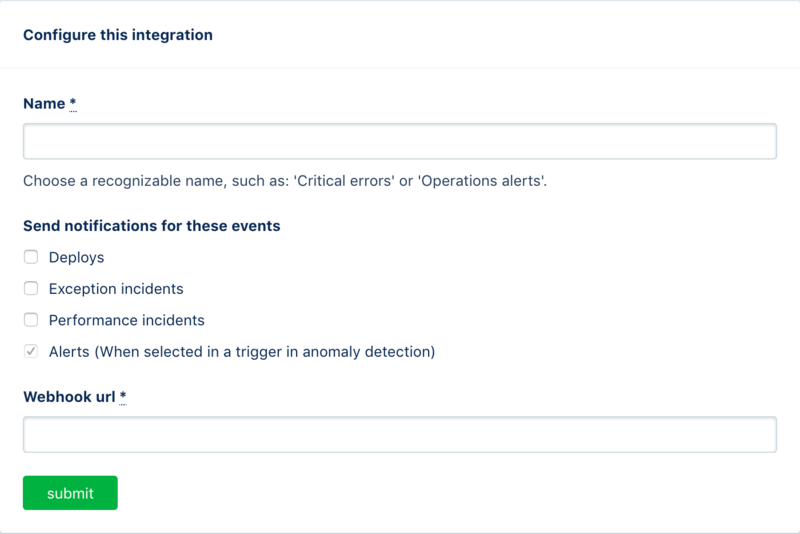 AppSignal can send notifications of new incidents to several services, see our full list on the integrations. We also offer webhooks for these notifications so you handle new incidents in your own system. To receive a webhook, go to the "Notifications" tab the site's sidebar, click the "Add integration" and fill out the URL where you'd like to receive your webhook data. There are multiple webhooks available. Which payloads the webhook receives can be configured in the configuration form for the webhook as seen in the screenshot above. marker Hash<String, Any> The webhook payload concerns a marker incident. time String Timestamp at which the deploy marker was created. marker_id String Internal AppSignal marker id for the deploy marker. site String App name as seen on AppSignal.com. Using the site field instead of app for legacy reasons. environment String App environment of the app as seen on AppSignal.com. revision String The deploy marker revision name. user String The user that created the marker. repository String Url to the repository as configured for the app on AppSignal.com. url String Url to the app on AppSignal.com that triggered the webhook. exception Hash<String, Any> The webhook payload concerns a exception incident. time String Timestamp at which the exception occurred. incident_id String Internal AppSignal incident id for the incident. number Integer Incident id as shown on AppSignal.com. app_url String Url to the app on AppSignal.com that triggered the webhook. url String Url to the specific sample for the incident on AppSignal.com that triggered this webhook. user String The user that created the marker. The user value can also be null if not set for a deploy marker revision. namespace String The namespace in which this exception occurred. exception String The exception type that was recorded by AppSignal. message String The exception message with more details about the exception. app_backtrace Array<String> The lines of the backtrace concerning the app from which they originated. This excludes any backtrace lines from libraries that are included in the app. first_backtrace_line String The first backtrace line from the app_backtrace field. action String The action in which this exception occurred. Either a controller action, background worker or a manually set action. path String The request path on which the exception occurred. This is only set for web requests. This is metadata set by the AppSignal integration by default and is also included in the metadata field. hostname String The hostname of the host that this exception occurred on. action_label String A human friendly label for the type of action this exception occurred on. Uses request for the web namespace and job for the background namespace. All other namespaces use action. metadata Hash<String, String> This includes user set metadata (see for Ruby / Elixir). You can add your own metadata by tagging samples (for Ruby / Elixir). demo_sample String Set by the AppSignal integration for demo samples send using our demo command line tool (Ruby / Elixir). Not set for all other samples. method String The request method used to perform a request. Only available for (web) requests. path String The request path on which the exception occurred. This is only set for web requests. Contains the same value as the path field. performance Hash<String, Any> The webhook payload concerns a performance incident. time String Timestamp at which the performance incident occurred. namespace String The namespace in which this performance incident occurred. duration Float The time in milliseconds measured which the request/job/action took to complete. action String The action in which this performance incident occurred. Either a controller action, background worker or a manually set action. path String The request path on which the performance incident occurred. This is only set for web requests. This is metadata set by the AppSignal integration by default and is also included in the metadata field. hostname String The hostname of the host that this performance incident occurred on. action_label String A human friendly label for the type of action this performance incident occurred on. Uses request for the web namespace and job for the background namespace. All other namespaces use action. path String The request path on which the performance incident occurred. This is only set for web requests. Contains the same value as the path field.